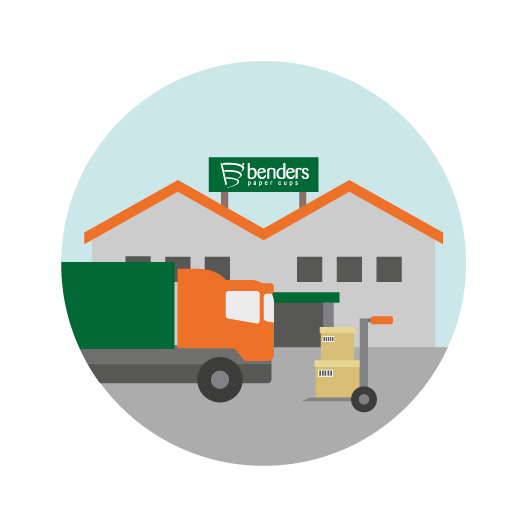 Benders Paper Cups began an exciting journey in 2015, establishing a social media presence through Twitter and LinkedIn, as a way to reach a wider audience of industry professionals and people who share an interest in the products that we manufacture. Social media has created new and impressive opportunities to communicate product information and relevant news, keeping customers and peers informed of stories that will be of interest to them. By utilising this intuitive method of communication, we have rapidly gathered 500 followers – a milestone on Twitter. Throughout 2016 Benders will evolve this presence, launching a number of hash tag campaigns through our social media channels to clearly communicate and demonstrate our core values. Our premier campaign #dontbeamug is a showcase of the key products in the comprehensive Benders range, focussing on Caffe single wall paper cups and Verona single wall vending cups. Benders’ classic Caffe stock design is well established and regarded as one of the most iconic stock designs in the On the Go market. The rich colours and easy styling effortlessly compliments a range of high street outlets and service styles. Caffe single wall paper cups are available in a comprehensive range of sizes including 4oz paper espresso cups, 6oz and 8/9oz catering for traditional European style hot drinks menus and 10,12 and 16oz are ideal cups for the high street, facilitating drinking on the go. A range of paper cup lids have been developed to compliment these single wall paper cups available in white or black. The 8/9 and 10oz paper cups and the 12 and 16oz paper cups have common rim diameters, allowing the same lids to be used for both cups. This reduces SKU’s and maximises storage space which Benders recognise is a premium for most high street outlets. As an industry specialist, we understand vending, and we understand that when it comes to the perfect vend quality and performance is key. Featuring industry leading construction for reliable performance, Benders Verona single wall vending cups ensure trouble free vending reducing machine blockages and maintenance costs. Verona is a contemporary stock design, specifically created to support the vending of premium hot drinks. The design is driven by the influence of the high street; the deep warm colour palette fits seamlessly with coffee bar culture. Verona enables operators to take full advantage of the growth in image and service quality today’s consumers have come to expect. Benders single wall vending cups feature the largest range of sizes available in the market, developed by industry experts from 6oz through to 12oz including a 12oz super stacker variant. A range of paper cup lids are also available to fit these single wall vending cups in white or black. The domed shape means they are great for frothy drinks and the secure ‘click fit’ gives great saftey if drinking on the go. Both of these key products in the Benders range are manufactured using raw materials from PEFC Chain of Custody certified sources. PEFC is a globally recognised standard demonstrating that the materials we use have been sustainably sourced and can be traced through the entire supply chain to guarantee the provenance of the finished product, as well as compliance with EU timber regulations. The entire Benders range including Caffe and Verona cups are manufactured in the UK in our BRC/IoP Global standard for Packaging and Packaging Materials, A-Grade certified factory; a clear demonstration of our commitment to providing expertly manufactured paper hot cups for the Coffee to Go market, a quality standard our customers have come to expect from us. Click here for more information on these products as well as the entire Benders range. 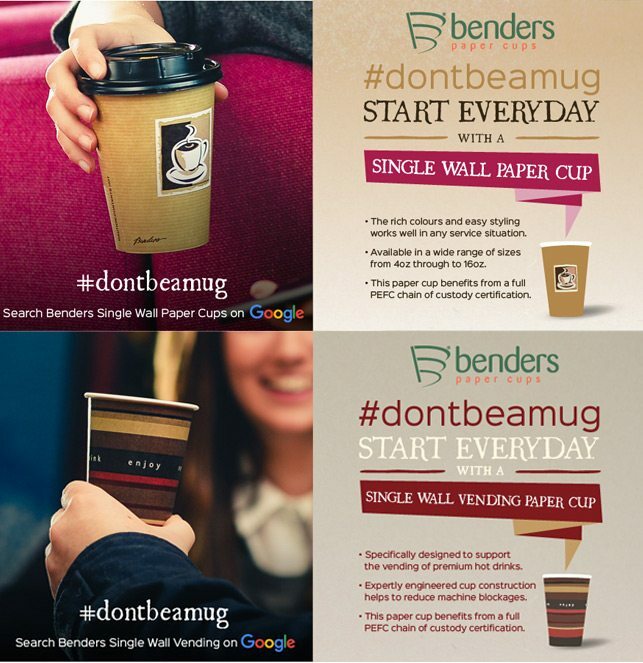 Follow us using @BendersCups and tweet us using #dontbeamug, and show your support for quality paper cups today.